Despite having the best regular-season record, the San Antonio Spurs had some problems on defense — particularly containing ball handlers in pick-and-roll situations. According to Synergy Sports, they were last in the league in terms of points per possession allowed to ball handlers in these plays. I expected the Los Angeles Clippers to exploit this weakness with PNR plays for Chris Paul and for him to take over like he did against the Grizzlies. But that’s is not what happened Tuesday night. The Spurs were able to hold Paul to just six points on 3-of-13 shooting, and, while he did have 10 assists, the Spurs forced Paul into five turnovers, as well. How did this happen? 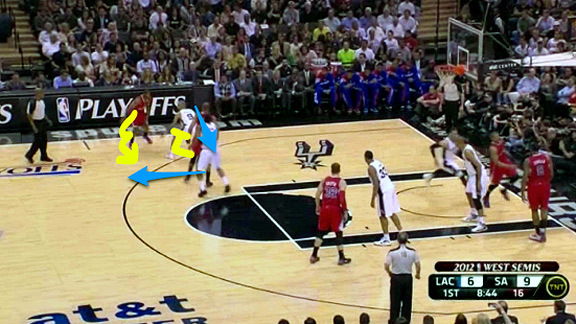 Like Miami has to defend Indiana, the Spurs must limit the side pick-and-roll to stifle the Clippers’ offense. The difference in this series, though, is that the Spurs must stop the ball handler (Paul) and not the roll man, and that’s just what they did Tuesday night. San Antonio held Los Angeles to a PPP of 0.778 in side pick-and-roll situations with Chris Paul as the ball handler. 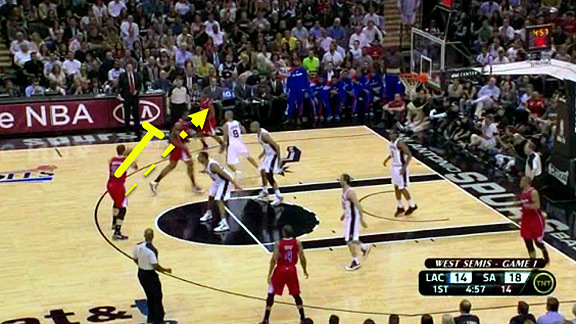 In fact, San Antonio’s defense was so effective that the Clippers all but abandoned that strategy down the stretch. They only ran it once in the second half and not at all during the fourth quarter. After setting a backscreen for Randy Foye, Caron Butler steps up and sets a ball screen on the wing for Paul, trying to allow him to get to the middle of the court. But Kawhi Leonard pops out and hedges, getting his body completely in front of Paul to stop the dribble. 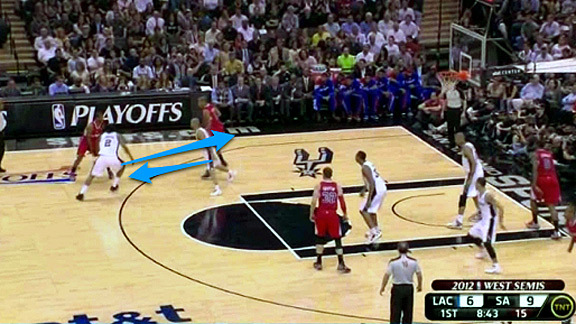 As that happens, Tony Parker is working his way around the screen any way he can — in this case, he’s going under it. Now, this isn’t a trap like we see Miami do time after time; this is just a simple hedge. Leonard pops out and stops Paul’s attack, which allows Parker to recover. Anytime you can turn a Chris Paul pick-and-roll on the side into a spinning fadeaway 3 as the clock expires, the defense has done its job. 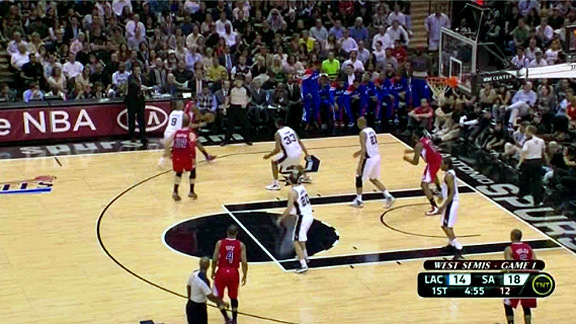 A common Clippers play is for a big to pass to Paul and then follow the pass with a ball screen. That’s exactly what happens here. Paul dumps it to Griffin and goes to the corner. Then he gets the ball back from Griffin, who follows the pass and gets in position to screen. This is where your “blue” (or “down” or “ice”) happens. The defense denies the ball handler and forces him to go along the baseline. 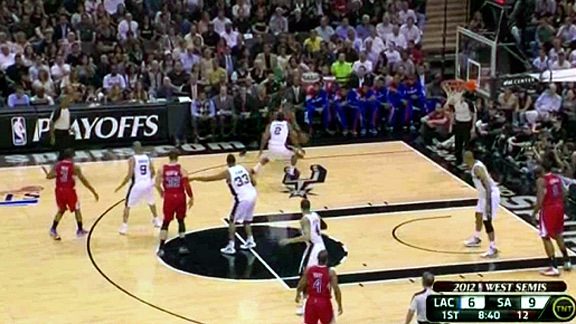 Here, Boris Diaw, the man covering Griffin, calls it out, letting Tony Parker know that there is a ball screen coming. Once Parker hears that, he adjusts his body, gets on Paul’s hip, and makes it impossible for Paul to use the screen. He has to dribble baseline where Diaw is zoning off the area. Paul generally makes the right decisions on the court — which means when they run the side pick-and-roll, he passes it instead of trying to dribble into the help defender. And as I said above, if you can keep Paul from getting to the middle of the floor with the ball, that’s a win for the defense. Look at the guys taking these shots instead of Paul: Randy Foye makes a contested 3, but I’m sure the Spurs can live with that. 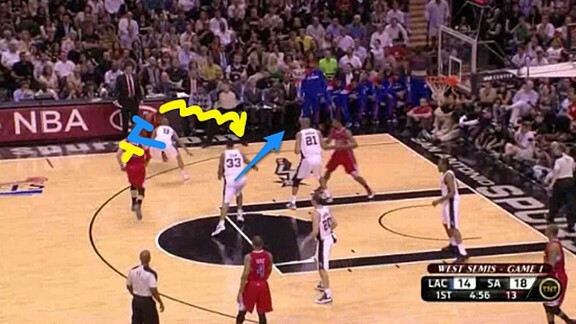 On the other two plays, Kenyon Martin and Caron Butler miss jump shots. The Spurs are making everyone other than Paul beat them. This is a great game plan from Gregg Popovich and the Spurs’ coaching staff. Chris Paul’s contributions were severely limited. It’s now up to the Clippers and Paul to counter.